Will your cases for iPhone 6 also fit the iPhone 6 Plus, and vice versa? Our cases are form-fit to each specific device for a protective, snug fit. Because the iPhone 6 and iPhone 6 Plus are different sizes, you will need to purchase a case that is designed for either iPhone. 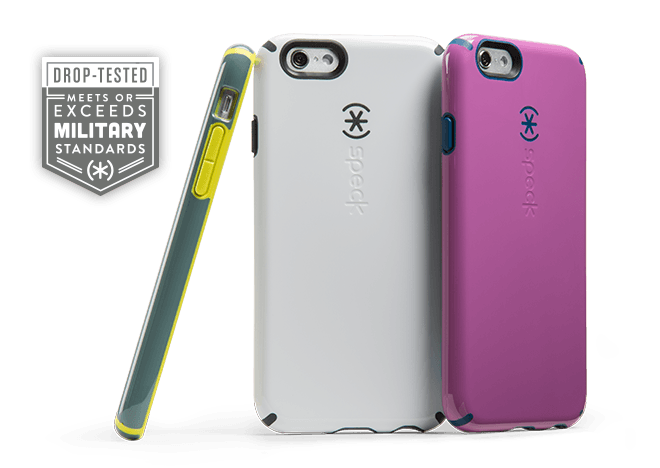 Be sure to check the name of the device on the product page before purchasing your Speck case. How do your iPhone 6 and iPhone 6 Plus cases protect the new ion-strengthened glass? The patented raised bezel on our CandyShell cases hugs the edges of the new iPhone’s curved glass for extra screen safety. This bezel is also rubberized to grip onto tables and prevent sliding on dashboards when placed face-down. Do your iPhone 6 and iPhone 6 Plus cases protect the raised camera lens or impede camera functionality at all? Our CandyShell cases will not impede your camera functionality at all. In fact, we’ve added a special finish surrounding the camera that reduces glare when you use your camera’s flash. The back of the case keeps the iPhone’s newly raised camera lens from making contact with surfaces for extra protection..
Are you making any more colors or designs for iPhone 6 and iPhone 6 Plus? We are continually designing new colors and patterns that change with the season’s latest trends. Sign up for our emails or follow us on our social media properties to find out when we release new cases for iPhone 6 and iPhone 6 Plus. Will you make any cases for the Apple Watch? While we don’t have any products currently, we are always looking at ways to enhance your experience with mobile devices. Will you have any discounts on these cases in the near future? We are always giving out exclusive deals and discounts to our newsletter subscribers. Once in a while we even host giveaways on our Facebook or Twitter. So sign up to hear about these offers first, and follow us for your chance to win! Click here to read more about the features of each of our new CandyShell cases for iPhone 6 and iPhone 6 Plus.